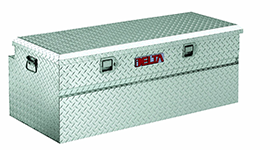 Delta is another truck tool box manufacturer that has been around for ages, more than 40 years in fact. They produce plenty of high quality aluminum and steel storage solutions. There are loads of models to choose from. And while having all this choice is great, but it can also be difficult to narrow down your choice. 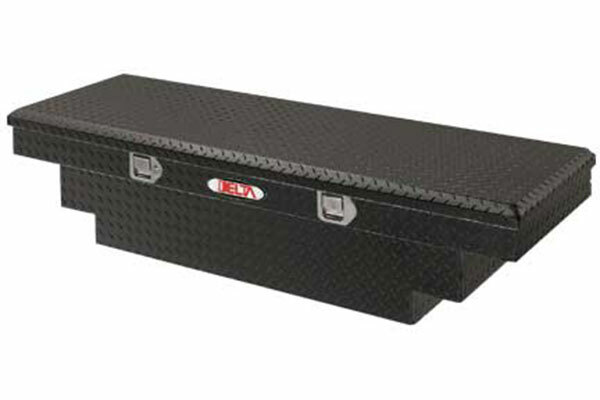 We’ve done extensive research on the subject, sat down and compiled this list of the best Delta truck tool chests available, making it easier for you to make the right choice. Check out this comparison chart to make quick decision, or read the full reviews posted below! The crossover style is without a doubt the most common out there. The box spans the width of the truck bed, sitting on top of your truck’s bed rails, fastening directly to the bed rails. Some folks don’t like the single lid, because it can make certain tools harder to access, since you’re reaching over the side of your truck to get at the handle – if the box is open. If the box is closed, you’ll have to get in the back of your truck and lift both handles. For most folks, the single lid is definitely sufficient, although you may be required to get into the back of the truck to get at your tools. This is our top pick of all the Delta boxes because of its versatility. It is available in four different sizes: standard, slim, deep and low-profile. Each variation is still made from the same quality materials, just with slightly different measurements for different uses. We’ll outline the size differences in that section further down. The two small compartments on either side of the box where the box sits on the bed rail can be used for storage of smaller materials. Delta manufactures their products from some of the highest quality aluminum in the industry. They are tough and sturdy, and can definitely take a beating. The aluminum is lightweight – great to keep the weight down – while still maintaining strength (stronger weight to strength ratio than steel). There are two gas springs mounted on the lid that help make the lid self-rising, making it easy to open, and stay open. The lid is made with what Delta calls a Rigid Structural Lid design. Basically, the lid has its tough aluminum outer shell, foam insulation for rigidity without extra weight, and a lid liner. It all adds up to a sturdy lid to keep your tools safe and secure. 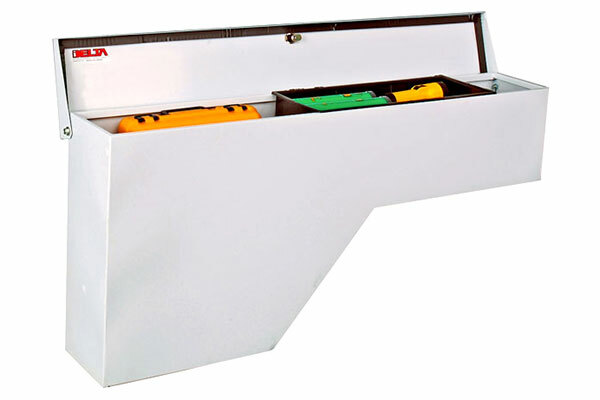 This crossover style Delta tool box is also available in two colours. You can stick with the classic, shiny metallic look of the unfinished model, which looks great if you have a lot of chrome on your rig. Or, you can choose the powder coated black colour, which also looks unreal. Because aluminum is corrosion resistant, the black powder coat is just for looks, but it sure does look good. The lid locks up, keeping your tools safe from thieves. The handles are leak-free, and sturdy. The paddle style handles are made of stainless steel and lift easily. To open the box, you need to lift both handles which can be a pain for some folks. You’re better off to leave the box open while you need access to your tools or take everything you need out all at once. Not only are the handles weatherproofed, but the lid as well. A strip of rubber runs along the interior of the lid and makes a water tight seal with the tub of the box when closed. Your tools will stay dry and free of dirt and other contaminants. What’s great about the crossover style is that it’s compatible with virtually every pick up truck on the road. Of course you’ll want to double check the exact measurements of your truck, but Delta offers full-size, mid-size and super-duty and Ram versions of this tool box. Whatever truck you are shopping for, it should fit. The full size model features 4 different options: standard, deep, low profile and slim. The deep version adds an extra 3 inches of depth to the box, great for if you need the extra space. You’ll need to make sure your bed rails are high enough to accommodate it though! The low profile model has a thinner lid that only projects 2.5 inches above your bed rails, so that your view out the back window is not inhibited at all. By comparison, the standard model sits 5.25 inches above the bed rails. The slim model is 6.5 inches thinner than the standard model, great for if you need the security of the box but don’t need as much space. It’s important to keep in mind that they don’t make a deep or slim size for mid-sized trucks, and they don’t make a slim size for super-duty. Installation is easy, using simple J-hooks mounted underneath your bed rail that run up into the extension that sits on the bed rail. Final verdict? This Delta crossover version is a great buy. It’s an affordable option for a secure and strong, lightweight aluminum model. The multiple sizing options make it easy to choose the right size for your truck and the amount of tools you have – standard slim, low profile or deep. The single lid has a self-rising feature, but can be annoying to open since you need to lift both latches, likely from the back of your truck. This can be avoided by keeping the box open while working, or getting all the tools you need out at once. The stainless steel paddle handles are sturdy and water tight, and the weatherproofed, reinforced locking lid keeps your tools dry and safe. And, it’s backed by Delta’s 1 year warranty. 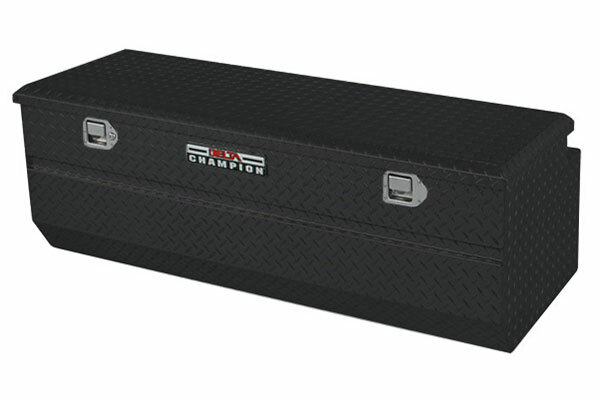 If you’re in the market for a crossover style tool box, this Delta tool box is a great choice. Next up is Delta’s Gull Wing style. Technically, it’s not really a gull wing box, but what Delta calls a “mid-lid” box because there is no empty space between the lids, but the two lids share a hinge. It’s still a gull-wing box in our eyes, though. However, the mid-lid design allows for a 20% larger lid than a classic gull-wing model, making it easier to get into the box. 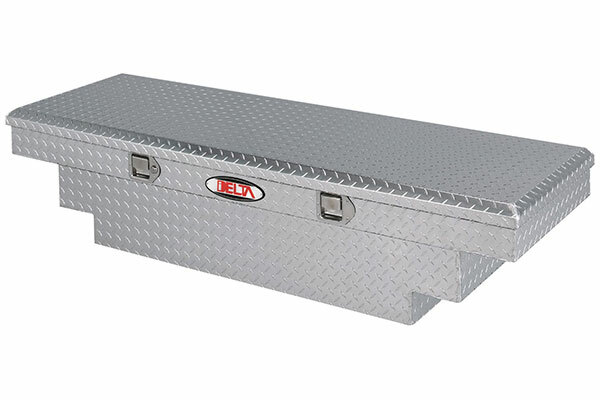 It is also still considered a crossover style, since it sits on your truck’s bed rails, but this Delta tool box has two lids, which open towards the center of the box, making it a Gull Wing style. Having two lids arranged in this fashion eliminates the negative of a single lid box like the one we just covered above. The lids are easily accessed from either side of your truck, making it super quick and handy to get at your tools (as long as you remember what side you have them on). If you think you’ll be in and out of your tool box throughout the day changing out tools, this may be a better choice for you. The downside is that it isn’t available in as many size variations as the single lid crossover box. There is a full size and mid size model available, but no slim, deep or low profile variations. 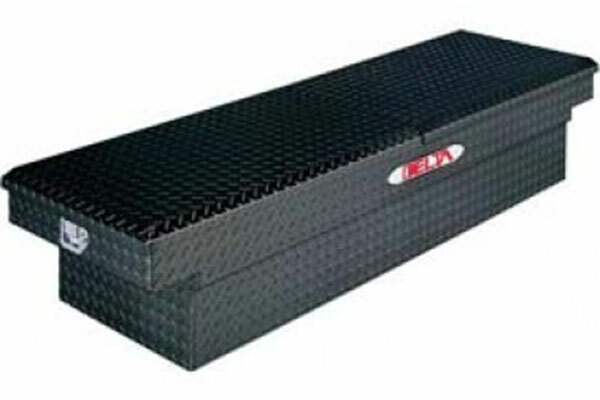 This Delta tool box is made of the same quality reinforced aluminum that Delta uses for all its boxes. Diamond plate aluminum is really the standard for these boxes, it looks great and is strong and resilient. The same reinforced lid design makes for a strong, rigid but lightweight lid. Both lids have self-rising gas springs that make the lid easier to open and stay up. It is also available in two finish options. You can get the box unfinished, if you’re looking for the shiny, metallic look. Or, you can get it with a black powder coated finish, which looks really nice as well. The finish makes no difference in rust resistance since aluminum is naturally corrosion resistant, it’s just for looks. Of course, this Delta tool box locks up, keeping your tools safe from anyone looking to score some tools at your expense. The lock is mounted right next to the stainless steel paddle handle, so it’s easy to get in and out of the box when it’s locked. The sturdy aluminum tub and lid should keep your tools safe from anyone looking to pry or cut into the box, as they may (hopefully) just move along and not bother. There is rubber stripping that runs along the perimeter of the inside of the lid to help seal out any moisture, snow or rain, as well as dust and dirt. Your tools should stay clean, dry and rust-free inside. This gull-wing style Delta fits both full size and mid size trucks. Unfortunately, there is not any slim, deep or low profile versions of this box available, just the standard size for mid sized and full sized trucks. Double check the measurements of your truck’s bed to be sure! Installation is like any crossover model, the box laying on top of the bed rails, with J-hooks fastening the box to the rail. One thing to consider is that Delta only supplies two J-hooks to install the box. We find that having four J-hooks makes the installation much more secure. Consider picking up a few extra (they’re quite cheap) or something like the Better Built Grip Rites. Are you going to be in and out of your tool box all day long? Switching out tools, getting new materials, trading your hammer for your drill etc.? Maybe a gull-wing style like this “mid-lid” Delta is your best bet. The two lids are easily accessed from the side of your truck, negating the issue of having to hop into the bed of your truck to get into the box. The diamond plate aluminum is sturdy and lightweight, and Delta’s reinforced lid keeps out moisture, dirt and locks up to deter thieves. It’s available in two colours: shiny metallic, and powder coated black, to fit with whatever theme your truck is rocking. Installation is a breeze, though we recommend picking up a couple extra J-hooks to make the fit more secure. This is a great affordable aluminum gull-wing truck box, and also includes a one year warranty. 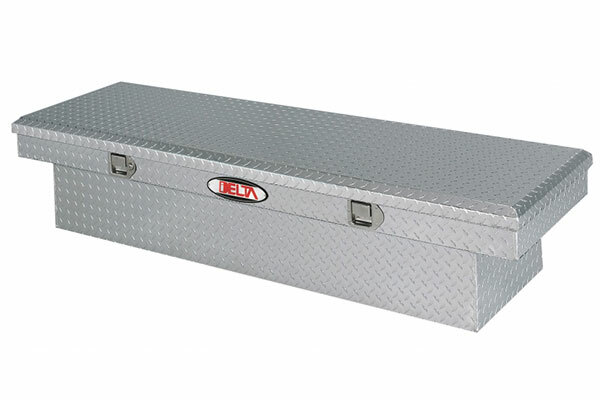 Next up is the Delta’s Chest style tool box for trucks. 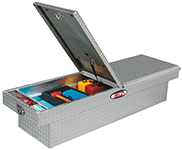 The chest tool box isn’t as common as a crossover style box, but it’s still a viable option for many. The biggest benefit to getting a chest-style is that it’s compatible for use with a tonneau cover. Because the chest mounts directly to the floor of the truck bed, the bed rails are free, allowing you to cover the bed and chest with a tonneau cover (as long as your bed walls are high enough) or a canopy. One drawback to a chest is that it takes up floor space in the truck bed. Most crossover boxes hang down into the box but don’t take up floor space which is great for when you’re hauling items like timber in the back. Just consider what you use the bed for most before deciding what style you should get. Of course, you can always remove the box if you really need to. The box also includes a small tray to help keep smaller items all together. Delta uses the same reinforced diamond plate aluminum in this chest as its other boxes. As we’ve mentioned previously, aluminum is a great material because it is very strong and durable, while still maintaining a light weight. This box is also available in two colours: the classic shiny metallic unfinished look, and a powder coated black version. The powder coat is a great looking matte black, but is purely aesthetic. Aluminum is naturally corrosion resistant, and doesn’t rust like steel or other metals. So even the unfinished aluminum is safe from rust and corrosion. Pick the colour that best fits the other accessories of your truck! And if you don’t overly care for one or the other, you could always go shiny, since the black could be victim to scratching and other imperfections over time. 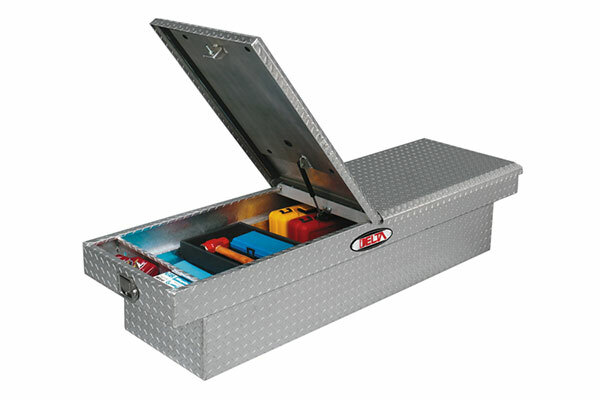 There are two stainless steel paddle handles that give you access to this chest truck box. The handles are leak-proof and won’t let moisture in, and the stainless steel is corrosion resistant. Only the left-hand handle has a lock, making it quicker to get into your box, but you still need to lift both handles to open the lid. The lid has three layers to it, made of aluminum and foam, which reinforce the lid without adding too much weight. The rubber weather strip runs along the lid that keeps out dust and water, maintaining a dry, safe place for your tools to be kept. Delta has mounted two auto-lifting gas springs making the lid easier to open. 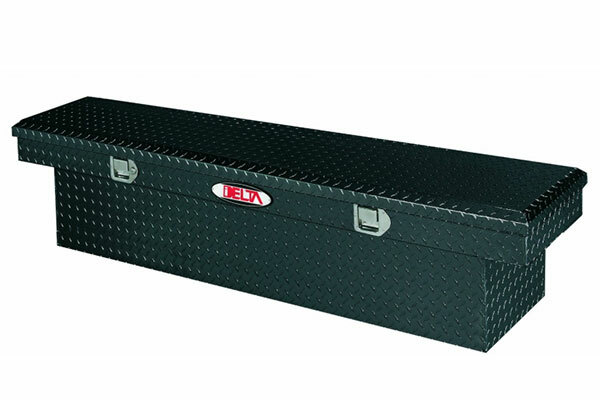 This box has a large capacity and is quite wide, fitting even larger tools. The box will fit most 2-door long bed full size trucks, 4-door full size trucks, and also comes in a smaller size to fit 4-door mid sized trucks. Make sure you also double check the measurements of your truck before buying. Making sure these measurements are accurate is even more important if you’re buying this chest style Delta tool box if you’re planning on using it with a tonneau cover or canopy. You will want to make sure the chest does not stick up past the bed rails. Installation for chests is a little more complicated than crossover boxes too. You’ll likely have to drill some holes in your bulkhead, or in the floor of the bed. Then you can securely fasten the box to your truck bed. It’d be hard for a thief to run off with a big, heavy container full of tools, but you’ll want to be more safe than sorry, and keep the box from sliding around. 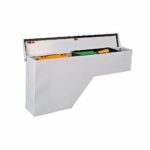 Overall, this is a great option for a truck chest especially if you’re going to be using the box in tandem with a tonneau cover or canopy, this is a great choice. Otherwise, we would recommend you pick up a crossover model. They’re much easier to mount in your truck, and take up less space in the bed. 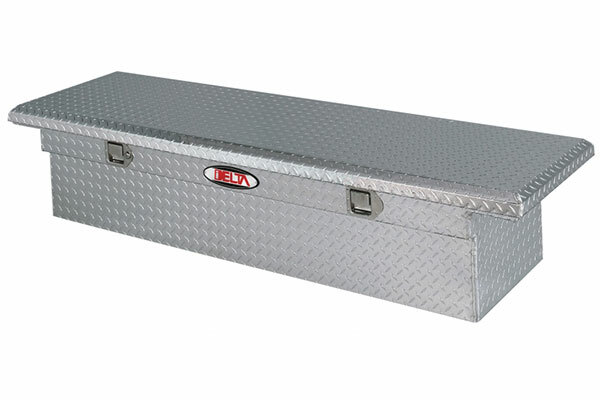 However, this Delta has a large capacity, is made of quality aluminum and other materials, and will certainly keep your tools safe and dry if you’re looking for an affordable chest style tool box. 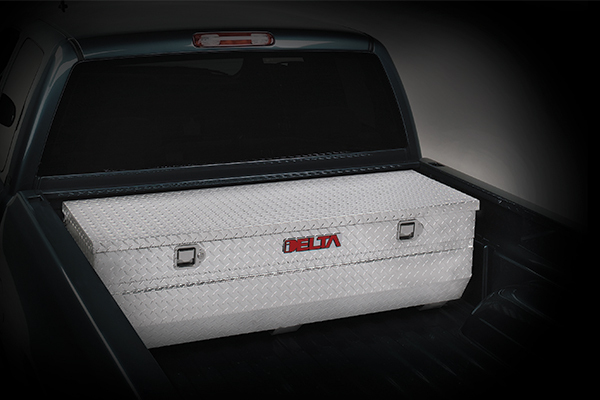 Wheel well tool boxes like this Delta are a great addition to your truck that add secure storage space without significantly reducing the space of your truck bed. These wheel well storage containers are very handy, and fit in the empty, otherwise unused space between wheel well and tailgate. These boxes are on the thinner side, but still a perfect size to fit smaller tools like drills. They also include a built-in divider, and a sliding tray for keeping smaller tools and hardware organized. Whatever tools you store in the wheel well box are extremely easy to access, since you just drop the tailgate (or reach over the side) and they’re right at your fingertips! This is the first Delta tool box on our list that is not made of aluminum. Typically, truck accessories are made from aluminum, since it’s strong and durable, while still being light. And, it’s naturally corrosion resistant. Steel is still a great material for boxes as it’s very rugged and strong however it is susceptible to rust. So, this steel wheel well tool box is covered in a white Armor Brite finish. The matte white looks really nice, and will keep your box protected from corrosion. However, you may find yourself needing to spend some time in the future touching up any scratches that develop, to maintain the rust-preventing coating. The cam-style lock keeps the box locked up tight, helping to reduce the risk of theft. The lid also features a thick black strip of rubber stripping that seals out dust and water, keeping your tools dry and clean. One thing we don’t love is the placement of the lock, since it’s mounted on the lid of the box. Water may be able to pool in and around it, causing it to rust shut. Just keep an eye on it. 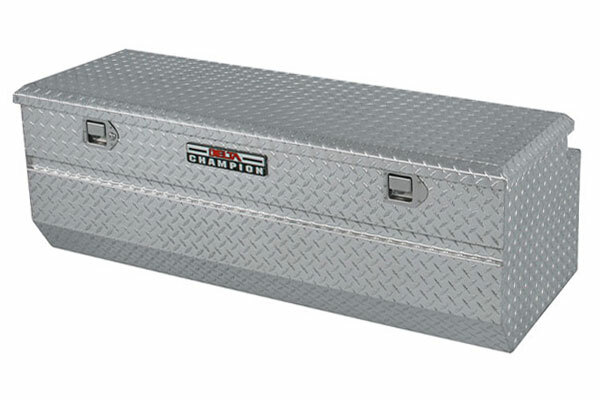 This wheel well tool box should fit most sized trucks, as Delta makes two sizes: one suitable for 48 inch high wheel wells, and one made . You’ll want to measure the height of your wheel wells, as well as the distance from wheel well to tailgate to make sure it will fit. If it’s a little off, you can always shim some wood underneath to make sure it sits level. Installation is easy, and will take you less than half an hour and requiring a few tools you most likely already have. If you’re looking for a wheel well model, this is a definitely a solid option. The walls are a bit thicker and sturdier than other aluminum wheel well boxes. However, the steel isn’t naturally corrosion resistant and the white Armor Brite coating is the only layer from exposing the steel to the elements. You’ll want to maintain the finish to ensure it doesn’t rust out. You’ll also want to keep an eye on the lock and make sure it doesn’t rust up on you. It’s weatherproof, lockable and comes with a one year warranty offered by Delta. Overall, it is a good option for a steel wheel well container. Did this article help you choose a Delta for your truck? Let us know your questions and concerns in the comments below!